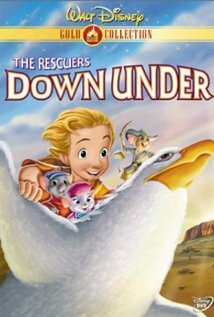 The Rescuers Down Under is one of those rare sequels that is better than the original. The original movie is just cute but the sequel is action pact and just amped up. That is not to say it doesn’t have its flaws but it is the finest Disney sequel and not in the same league with the other Disney sequels. 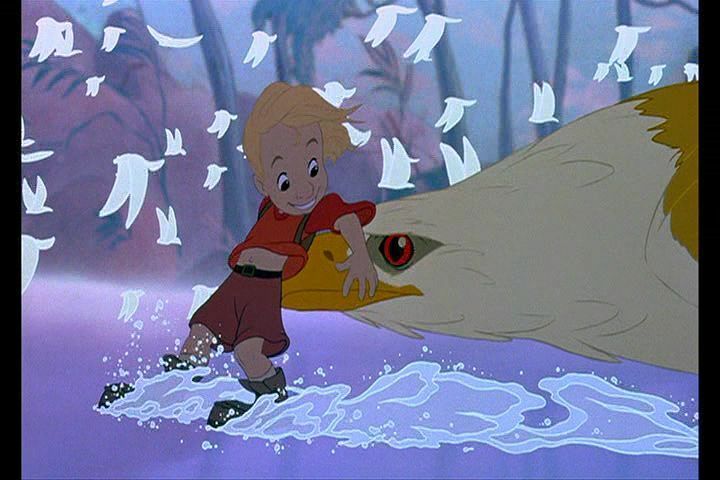 It is also one of the few sequels to be part of the Disney Cannon of Animated Films. What’s the Plot? In the Australian Outback, a young boy named Cody, saves a rare Golden Eagle, Marahute from a trap and befriends her. He meets her eggs and she gives him one of her feathers. Afterwards Cody saves a mouse form a trap but gets catch in a pit. The Poacher who setted the trap finds him along with his Goanna Lizard, Joanna. 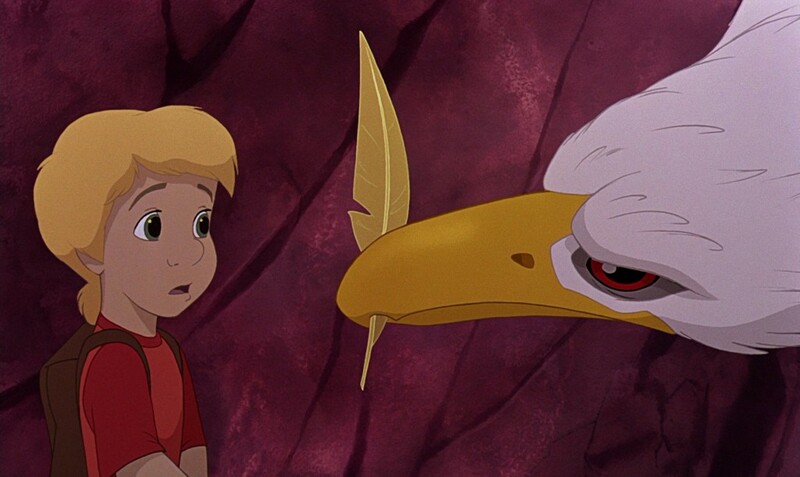 The Poacher, one Percival C. McLeach helps Cody out of the trap but when he finds the Golden feather he kidnaps Cody as he wants Marahute but needs the boy for info. The Mouse then contacts the Rescue Aid Society, RAS. The RAS recruits Miss Bianca and Bernard for this mission. Bernard however is trying to propose to Miss Bianca but news of the mission interrupts him. They chartered an Albatross named Wilbur and it’s off they go. Once there they make contact with a local mouse named Jake, who takes a fancy to Miss Bianca and volunteers as their tour guide and Wilbur get some less than needed back surgery. Surgery in a Disney movie, how wonderfully decadent. Cody in the meantime is not giving McLeach the information on Marahute’s whereabouts soMcLeach throws him in a cage along side other captive animals. Cody along side the animals try to get the key but they are thwarted by Joanna. In the end Frank, a Frilled Lizard escapes using his tail. However before Frank can save everyone Mcleach lets Cody go telling that Marahute is dead and soon the eggs will die. Mcleach lies to Cody so that Cody will go to the eggs and he will find Marahute. Miss Bianca, Bernard and Jake at this point have reached McLeach’s lair and try to warn Cody. But they all manage to tell Cody after he reaches Marahute’s nest. Mcleach then captures her along with Cody, Jake and Miss Bianca. Bernard is left behind. After Marahute is kidnapped, Mcleach sends Joanna to eat the eggs but Bernard switches the eggs for rocks, thwarting Joanna. Wlibur turns up and Bernard tells him to guard the eggs as Bernard leaves to help. McLeach then tries to kill Cody by feeding him to crocodiles but in the end Cody is saved and Mcleach is throw off a waterfall. As they all (except Joanna who lived) are flying off on Marahute. Bernard finally asks Miss Bianca to marry him and she says yes. The eggs then hatched under Wilbur. I really liked this movie, it’s fun, action pact and the animation is miles better than the original. The pacing is really great too. However the story isn’t that perfect. 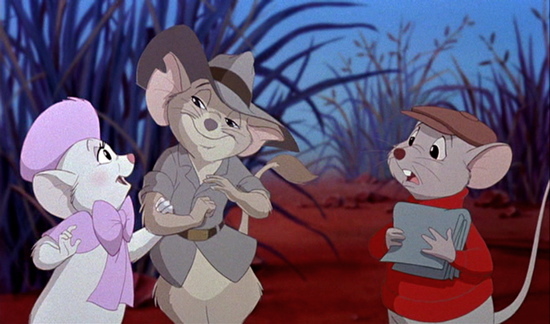 The Rescuers and Cody have very little to do with each other and the rescuers themselves feel more like a subplot. You also never get closure about the animals in Mcleach’s lair. I suppose you can assume Frank saved them but would have been nice to see it somehow. But they again after Cody leaves Mcleach we don’t go back so would have been a hard scene to go back to. Though those points are nitpicks. I think this movie biggest flaw though it that it came out in 1990, one year after Mermaid and one before Beauty and the Beast. Just bad timing as the action adventures of animals got pushed aside for Disney Princesses. The characters are also fun. McLeach and Joanna are awesome as silly yet menacing villains. Jake adds a bit conflict to Bernard and Miss Bianca but he’s not a jerk. Wilbur was fun and the surgery scenes were pretty silly. The captured animal scenes were bit long and some of the animals were a little annoying but the were too bad. Cody didn’t have much a of personality but he never bothered me. Joanna not taking should bothered me but Marahute doesn’t speak either, so I can forgive it. 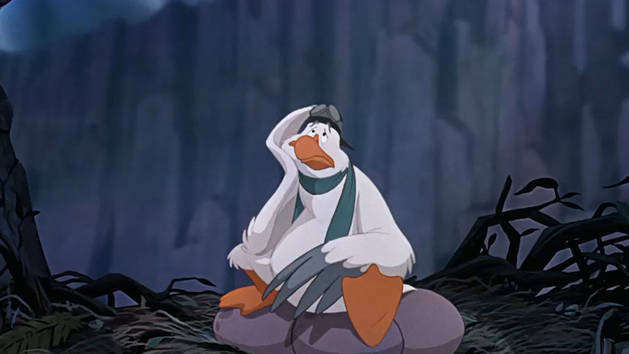 If you have been following my Disney Sequel reviews you will know that I tend to get caught up in animals vs habits. The Little Mermaid sequel teamed up a Walrus and Penguin saving other Penguins from a Hammer-head shark while a sea turtle swims by in the one of the Poles. The third one had a Manatee in the deep ocean. Tarzan messed up too, Warthogs in the Jungle, just because Lion King did it doesn’t mean you can. 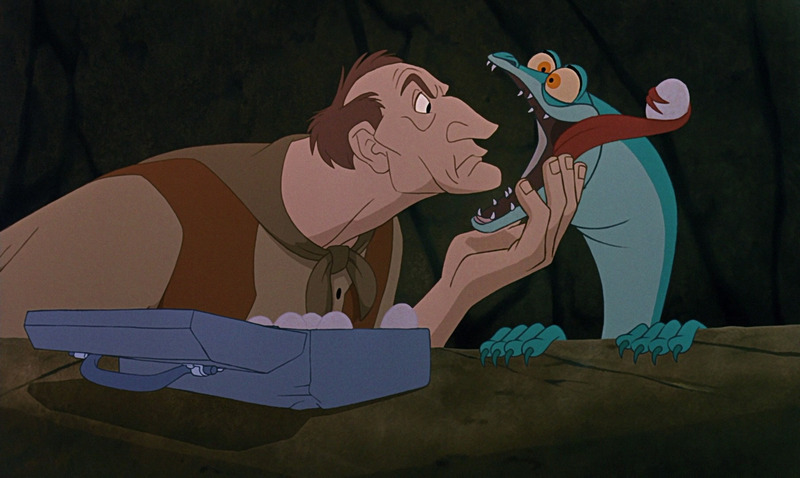 Anyway…The Rescuers Down Under used animals that were native to the Australia. Even Marahute is based on something native to the area albeit New Zealand, Marahute is based on the Haast’s eagle, extinct large Eagle from the South Island of New Zealand. Haast’s Eagle is also part of Maori legends. In the movie Marahute feels magical but it nice to see that she is based on something relevant to that area of the world. Joanna is pretty awesome. She’s goofy but she is smart. In one scene she stealing eggs from Mcleach and tricking him in the process. But she calls attention to the fact that Joanna is one of the few Disney female minions. I mean there are penalty of females villains but the only other female minions that I can think of that are minions are Shenzi and the chick from Atlantis. You could count the step-sisters from Cinderella and Si and Am from Lady and the Tramp though their gender is non-specific. If I forgot any other female minions, I’m sorry but there is a lack of them. In all likelihood Joanna was probably a female as word play with the Goanna lizard. But I like they didn’t feminized her. I mean they could have thrown a bow on her or long lashes. It probably a political thing, they don’t want to place a female character in a role that is subservient. I can understand it but it nice to see female roles of equal playing field and Joanna proves that a female minions can work because Joanna is awesome. 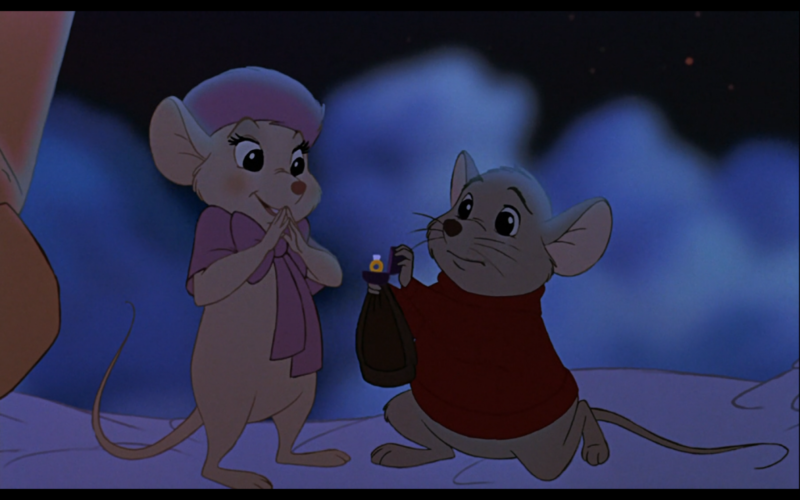 Before I end, I just want to say that Miss Bianca and Bernard are adorable, I loved the proposal subplot. It was just so endearing. I could argue that there wasn’t enough of them in the plot but I think less is more with them. I just wish they had some more dialogue with Cody that’s all. 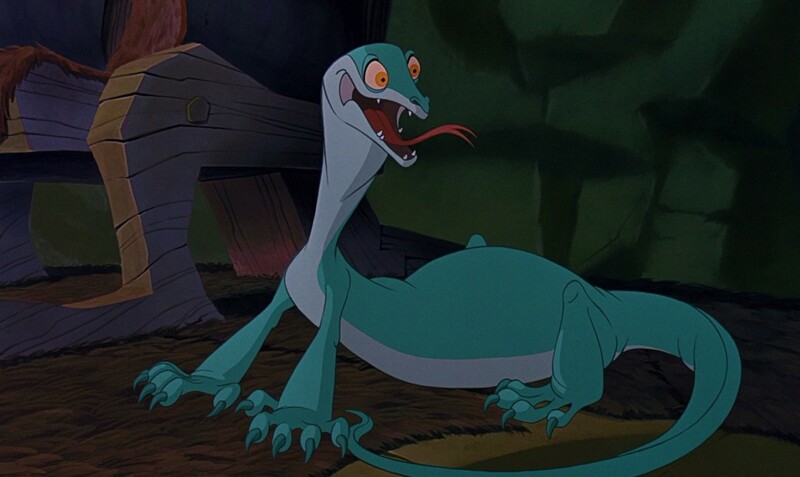 The Rescuers Down Under is a really awesome movie that deserves more love. 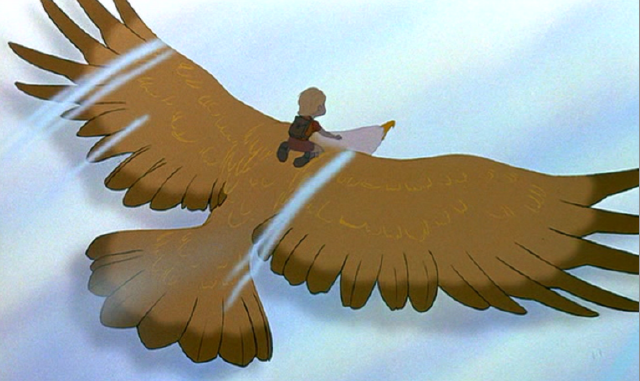 It’s fun and has gorgeous animation, that flying scene is amazing. It way better that the first movie.